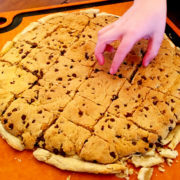 This Vegan Chocolate Chip Cookie Pizza recipe was inspired by our 8 year-old niece, Madeline, who asked if we could combine her two favorite things: pizza and cookies. That’s her hand reaching for the center cookie in the picture. 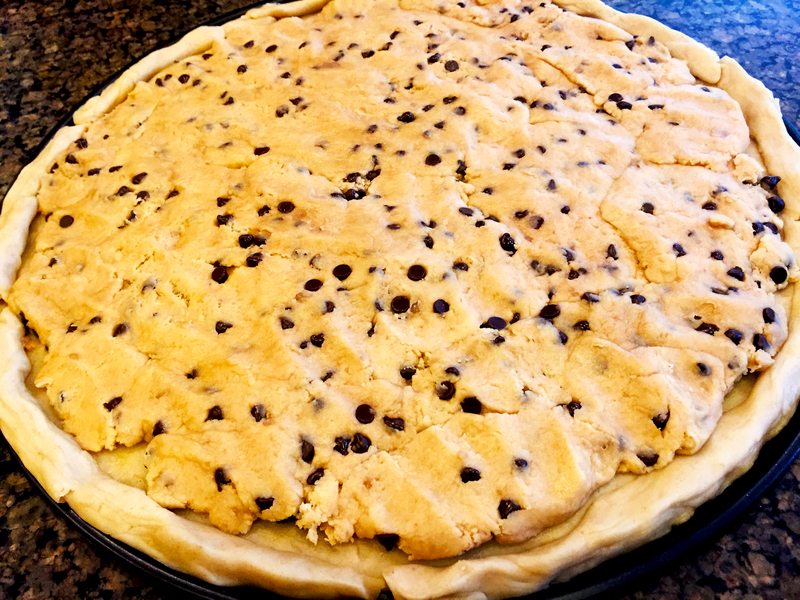 Amelia happily accepted the challenge and created this absolutely delicious and decadent treat by combining my mom’s Vegan Pie Crust recipe and our Vegan Chocolate Chip Cookie recipe. This recipe is so amazingly delicious that there were actually family debates over who ate the most and where the best hiding place was for the rest. In fact, tempers were elevated when I suggested I ate all of them. But order was restored when I retrieved them from my secret hiding place. Most of the plant-based recipes we post are healthy, but there’s nothing healthy about this one. Life is short, though, and sometimes we just want a sinfully decadent dessert. 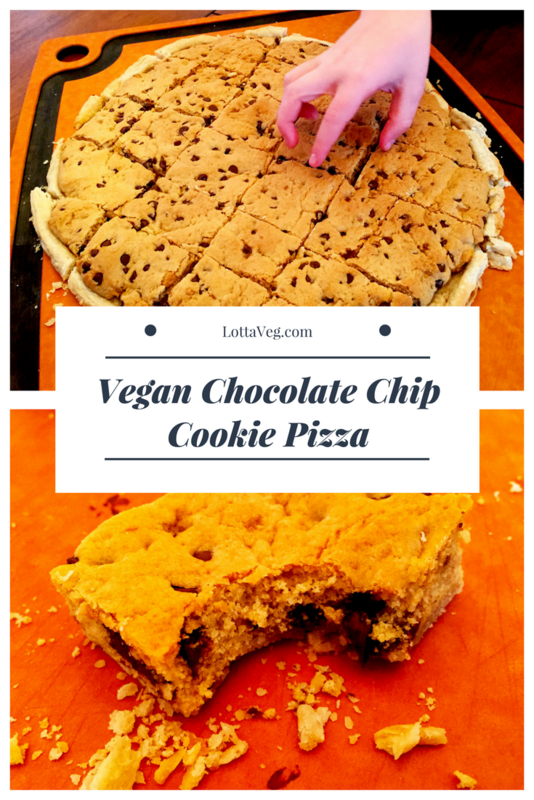 Plus, it’s hard to resist an adorable 8 year old girl who asks for a Vegan Chocolate Chip Cookie Pizza! 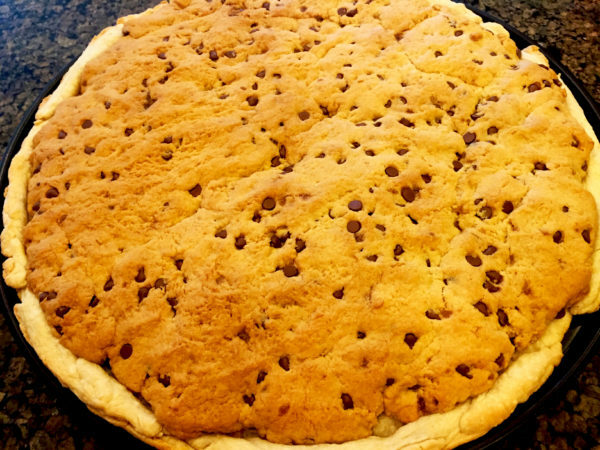 This Vegan Chocolate Chip Cookie Pizza recipe was inspired by our 8 year-old niece who asked if we could combine her two favorite things: pizza and cookies. Prepare the Vegan Chocolate Chip Cookies batter according to the linked recipe. Prepare Mom’s Famous Vegan Pie Crust according to the linked recipe. You only need one crust, so cut the recipe in half. Roll the pie crust out on a baking sheet and curl up the edges. 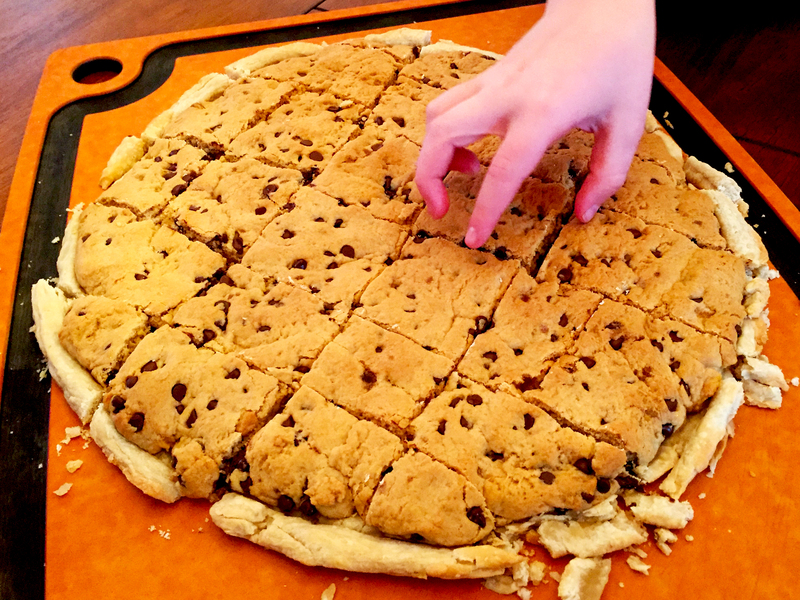 Spread the cookie batter evenly over the pie crust. Bake for 10 to 15 minutes or until the cookie dough and crust are golden brown. Cook less time for softer cookies, more time for crispier cookies. Serving size is one square about 2"x2".